Bottom line: As we saw in Schumpeter’s Ghost: Is Hypercompetition Making the Best of Times Shorter?, we are currently living in a world where the duration of sustained competitive advantage has shortened over time. Managers react to this hyper-competitive environment by switching from building and sustaining a single advantage over time to a series of short-term advantages that can be concatenated over time. In order to build these short-term advantages, managers need to increase the speed at which they make strategic decisions. However, this type of high-velocity environment is challenging because information is poor, mistakes are costly, and recovery from missed opportunities is difficult. 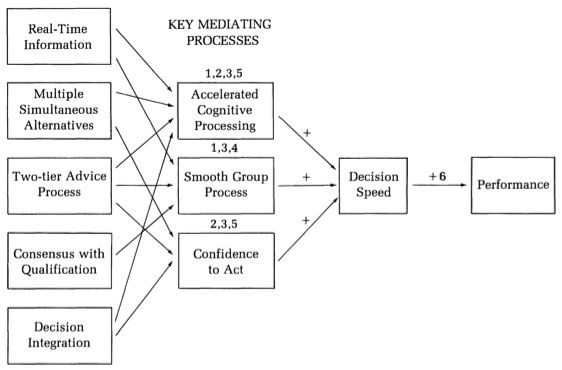 In this research paper, the author looked at how fast strategic decisions are made and how it is linked to performance. What they found: After studying companies and their executives, the author found that the greater the speed of the strategic decision process, the greater the performance in high-velocity environments. Fast decision makers use more information, develop more alternatives, use counselors, have proper processes to resolve conflicts, and integrate their strategic decisions in their tactical plans. What: Rapid teams used extensive real-time information on firm’s competitive environment, operational indicators and they tend to interact via synchronous communication (face-to-face or with tools like Slack). How: It is important to distinguish real-time information from forecasted information. Real-time information is defined as information where there is little or no time lag between occurrence and reporting. Deep knowledge about the organization allows them to access and interpret information rapidly when major decisions arise. On the other hand, forecasted information is done by using information about the firm and extrapolating it in the future. Why: Real-time information helps executives to make faster decisions by speeding up the issue identification, by developing intuition about changing stimuli in their firm or environment and by allowing executives to gain experience in responding as a group. What: Slower teams usually considered fewer alternatives and looked at a new alternative when an old one was no longer feasible. Rapid teams are characterized by simultaneous consideration of multiple alternatives. How: Simultaneous alternatives are options considered during at least some overlapping periods whereas slower teams considered sequential alternatives at times that did not overlap. To generate alternatives, executive teams usually do brainstorming and/or scenario planning sessions. Why: Studying multiple alternatives help executives make faster decisions because alternatives are difficult to assess in insolation and by comparing them, it makes it easier to uncover their strengths and weaknesses. Furthermore, by having multiple alternatives at the same time, executives are less prone to cognitive biases as they have less psychological stake in any of the alternative and they can fall back to other positions. What: Slower teams had no counselor or had a less experienced executive in the counselor role. Rapid teams seek counsel from all the members of the management team, but they also focused on obtaining advice from one or two other key resources, either internally or via consultants. How: Every team making rapid strategic decisions had at least one experienced counselors and this role was frequently filled by the most experienced executive. Why: Counselors usually provide a sense of confidence to the executive team because of their experience, expertise and their ability to see strategic decisions from an external perspective. These factors help counselors overcome the psychological barriers that executives have when making high-stakes decision in fast-paced environments. What: Slower teams had issues with conflict resolution and delayed the decisions until external events forced a choice. Rapid teams had decision makers resolving issues proactively by their own. How: Most of the fast decision-making teams used the same process called “consensus qualification.” In this process, the executives try to reach consensus by involving everyone. If agreement occurs, the choice is made, and if there is disagreement the key decision maker makes the decision with input from the entire team. Why: Consensus with qualification helps executives make rapid decisions because it provokes discussions rather than having to wait for outside events to provoke these discussions. Furthermore, it allows executives to have a voice without having to make decisions outside of their core areas. On the other hand, consensus building involves politics which usually slow down the conflict resolution process. In the case of strategic decisions it can be risky as there is no obvious forcing mechanism, like deadlines, to push the team to make decisions. What: Slower teams usually see strategic decisions as separated from the rest of the business decisions. Rapid teams integrated these decisions with other major decisions and with tactical plans. How: The fast decision teams did not use complex systems to integrate decisions, they just kept in mind multiple decisions and supplemented it with brief plans and action-oriented documents. Why: Decision integration helps executives to analyze the viability of an alternative more quickly, to deal with the ambiguity of high-stakes decision-making and it limits discontinuities between decisions. Rather than keeping decisions at an abstract level, developing specific plans give executives a better understanding and provide a sense of control that produce the confidence to act. Final words: According to the research of the author, faster decision-making is associated with better performance and it is linked with the use of real-time information, multiple alternatives, counselors, consensus with qualification, and decision integration. When executives are making fast decisions, they are able to learn more and when opportunities move quickly it is easier for them to catch up. These executives accelerate their cognitive capabilities by being conditioned to work together and by using efficient problem-solving strategies that maximize information and analysis within time constraints. In conclusion, executives need to be aware that faster decision-making is not a matter of doing whatever decision at whenever time, but it is linked with specific decision characteristics, recurring interaction patterns among executives and a confidence in the group. Read more: Kathleen M. Eisenhardt. Making Fast Strategic Decisions in High-Velocity Environments. The Academy of Management Journal, Vol. 32, №3 (Sep., 1989), pp. 543–576, http://www.jstor.org/stable/256434.